Well-done film about an unlikable person. Jake LaMotta is an unsympathetic, vicious, miserable human being brought to life in a brilliant performance by Robert DeNiro. 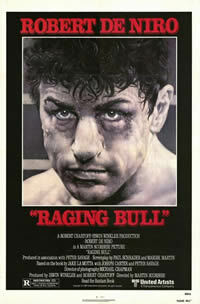 Scorsese portrays the violence and brutality of the sport of boxing and Jake LaMotta's personality excellently. A film that is difficult to watch, but definitely one everyone should see.